Drawing on over three decades of cutting-edge separations leadership, Postnova has designed an advanced orthogonal system that allows both SEC and FFF separations to be carried out on the same sample within one instrument platform. The result is enabling labs around the world to generate more useful information from even complex proteins, antibodies, polypeptides and polysaccharides. As both separation techniques in the Postnova 2000 Series FFF/SEC system can use the same optimised detector set - UV, RI and MALS (Multi Angle Light Scattering) realising the enhanced applications potential of the integrated system is achieved with minimal redundancy using an automatic switching value and software upgrade kit. Offering orthogonally operating separation techniques in same platform, the Postnova 2000 Series FFF/SEC system delivers unmatched diagnostic flexibility across an increased application range. 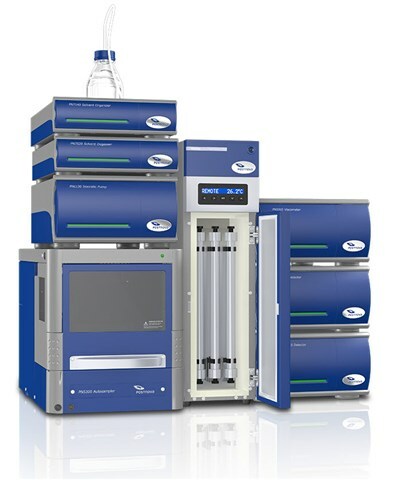 The system can be run with different eluents, pH and wide-ranging temperature conditions making it an ideal platform for the characterization of natural or synthetic macromolecules. Postnova FFF technology employs a unique crossflow field in which samples are separated by their dynamic diffusion based on molar mass or particle size. Because of this design and the absence of any stationary phase, separations are performed without exerting shear forces and stress on the molecules.